We have a large banquet room available for your events, parties and meetings. The west side of the room features a dance floor and stage, the east side of the room is carpeted with a pull curtain dividing the two sides. We also have a small meeting room available for your needs, it seats approx. 20. Contact the Lodge for scheduling availability. Our Kitchen serves quick foods (burgers, fries, chicken strips, etc) on Tuesdays evenings during Bingo. We also have a small dinner at 530pm on the 1st and 3rd Wednesdays (menu-cooks choice). Friday night Dogs on the Deck is serving BBQ burgers and dogs out on the patio, from 630-8pm. 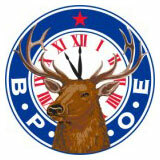 Forks Emblem Club hosts a prime-rib dinner at 530pm on the 3rd Saturday of the month. Our kitchen area is also available for rent for events/rentals, contact the Lodge for more information. Drink specials every month, snacks available, free popcorn. Typically a “31” card game kicks off every night and we have Texas Hold’em on Thurdays and Fridays. Our back Game Room features 2 dart boards, pool table and a shuffleboard. Dart tournaments are Thursdays 7:00, the Shuffleboard tourny is Sundays at around 2pm. The back patio off our bar is a fun seating area outside that is covered to keep you out of the rain.